Raclet trailer tents are among some of the most easy to open, use and enjoy. All the units feature a simple erecting system, meaning there’s no complicated pole systems to the main cabin. 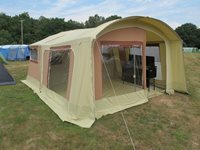 A Raclet trailer tent has a excellent build quality and is designed to last 20 years. The cotton canvas is exclusively manufactured to a high quality: 280 g/m² in the walls, and up to 340 g/m in the roof. All zips are manufactored by YKK ensuring you’ll still be able to enjoy the trailer tent for a long while to come. Raclet Safari. A large family size trailer tent that is easy to erect. The Armada is a simple, good looking, modern trailer tent suited to families who are just starting out. The Raclet Solena trailer tent is a hard top/base tent which can be erected in under a minute with no need to peg out.